WTF. The download link is a virus. Solved. I accidentally downloaded their downloader. Don't download it, it's a virus. Wait a minute... Why did Utopia Ray V get removed? The auto-update have one error, Percy... look this. percy but why utopia ray v is not there? when will get the exe alternative? Does a ranglist exist, where i can see who is rang 1? Psychiconductor Behemoth can't be summoned for some reason. It's not just Behemoth. I can't seem to summon Armades either. so that the field move. I say this to make a force like the psp tag and see a lot of improvement. An image for the menu. And a picture for the time to play a match. If possible and kieres clear. update (ranking) ?where is the ranking ? Percy, the game doesnt let me summon Armades, Keeper of Illusions and École de Zone cant be activated. Would be nice of you to fix this. thx in advance. I just download the new versione of the date I always update automatically but I cant play he always say failed to upen URL why? Percy the forest archetype in this update doesn't work. Gecko of the forest says "when this card is summoned:" In gameplay however Gecko only activates when normal summoned. Noble knight of the forest says "the monster that destroyed it loses 500atk but in game the monster only loses 300 attack. Gecko also says it can special summon and "forest" monster from your grave but only the manga cards can be summoned. Cards like Green Baboon defender of the forest can't be summoned. UltimaTrainer can't be summoned by using Barian's force on GianTrainer and GianTrainer still has a Japanese description for the effect. limited barian force is also gone..
and also, is noble knight medraut not a gemini monster? gagaga kid is no where to be found..whats happening why is there so many missing cards? Korea YGOPRO cafe of the Unauthorized modification, I want know your opinion. 2. medraut is not a gemini monster, but it's effect is equal to gemini monster when equpped with "noble arms"
"This card is treated as a Normal Monster while face-up on the field. While equipped with a "Noble Arms" Equip Spell Card, this card becomes an Effect Monster with this effect." Thank you for include nadeshiko and the other pre-chaos xyz but I can't see it very well, the pixeles, sorry for my English but I am Spanish XD, of course I love your esplendid work THANKS. A question, Can you include for the next version the cards "Supercolossal" of episode 92 plsss I LOVE them a lot. Thank you for everything XD. And C39 Utopia Ray V? When will you update all syngcro in judgement of the light??? No Medraut is not a gemini monsters. It would say "Gemini" in the picture if he was. Percy wht Utopia V is removed ? and why "Psychic Cyclone" Missing too?? when I am typing it is nothing but a spacebar no matter what button i type, and it is also counted as space bar as search. Can you help me ,please? Percy can u tell me why - Burning Knuckler - Leadblow the Bound Barbarian is not working against dark hole and mirror force. Cause in previous versions he wasnt destroyed by them, but in this, new version, is destroyed when he face against this 2 cards. Percy, i can't listen the main song, advantage, disadvantage. I can just listen the deck shuffling, normal/special summon... How can I fix that? Tokens can NEVER be used as xyz materials as they do not exist apart from being a monster - if they stop being a monster they are removed from the field so they cannot be xyz materials therefore cannot make an xyz summon. Can you pls fix cyber dinosaur..its attribute is light in card info but in pic its earth and heroic warhammer is earth in card info but light in pic..and granel spelling in the card info of meklord emperor skiel and grand core is double n [grannel] but is single N in the rest..and meklord emperor of granel which can only be special summoned when a monster is destroyed by effect.. text in the picture is meklord army of granel which can be confusing..skiel attack 5 level is lv 5 and in the card info is lv 3..emergency assistance which can only be used from your grave can also be used from your opponent can you pls fix this cause if so it will be a huge step to perfection. TNX!! Percy where is Utopia V? because is removed ? Why has no one requested for the Sealed Beasts to be added lol? I noticed that the linux version uses wine to run. Are you thinking about of launching a native version? Hi, I am the Admin on Chaos Era Academy. I made a post of updated card images I did. There are 20 cards in total, all higher quality images and correct card names and rarities. I figured I'd give these to you if you wish to use them for a future update. Umm why is the exe opening up like this? I mean the font is weird and on clicking any button the exe stop's working. Can you add that ? 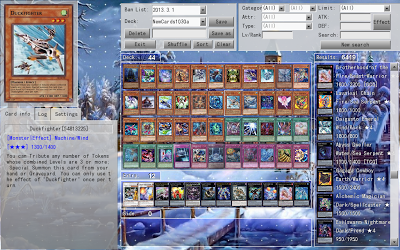 And can you create ygo pro as IPAD VERSION ? - If during the effect's resolution there are no Dragon, Dinosaur or Sea Serpent-Type monsters in the Deck, the targeted monsters are still sent to the Graveyard. This Trap is not active if no Dragon, Dinosaur or Sea Serpent-Type monsters in my Deck. NO!!! You cannot activate it if you have no valid targets in your deck. Percy try to fix "Exodius" effect to the next update if u can..
i activated skill drain when my opponent control thunder king ray oh. 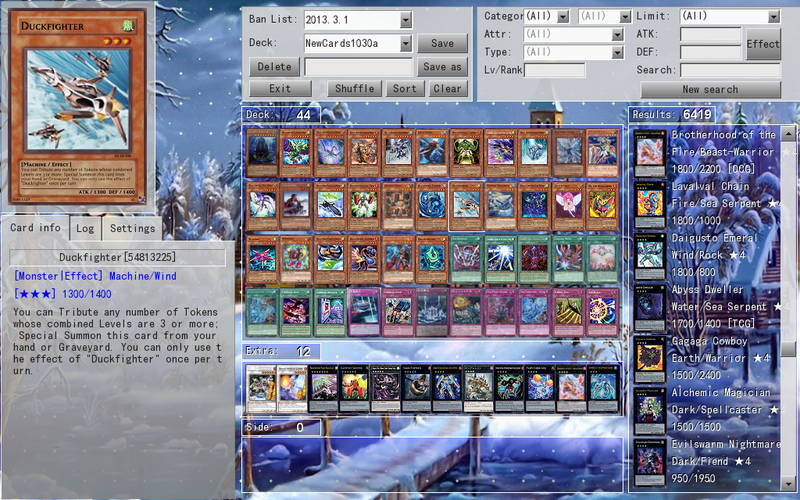 But when i special summoned malefic cyber end dragon, thunder king can negate it. Skill drain doesnt affect him? Pls fix it. Why Can't I use chaos end ruler even if I changed the balnlist? plz Help!!!! @dhika, coz TKRO negating eff is activated in graveyard, thus why tkro can still tribute himself?, coz tributing is a cost of tkro eff that activate in the grave. skill drain cant negate monster eff that activated in the grave. HI PERCY CAN YOU ADD A NEW SYSTEM ????? War God - Yamato doesn't work in end phase.